Rural Skills Training specialises in horticulture training and consultancy related to growing fruit and vegetables both at an individual and group scale. 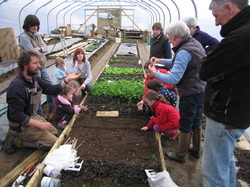 Two of the standard courses we can deliver are polytunnel culture and 'growing your 5-a-day', the latter developed specifically for children and families. The one day polytunnel culture course provides the practical skills and confidence necessary to maximise the fruit and vegetable production possible with a poly-tunnel. The techniques and principles of poly-tunnel growing are introduced to participants along with an introduction to choosing a tunnel and irrigation alternatives, choosing a site and construction considerations. own, garden, farm or croft or as the basis for productive indoor growing in a work environment, and to generate additional income. Pete is very happy to prepare a horticulture course covering the subjects you are most interested in, especially if you can provide a suitable site where the course can be held.